INDIVIDUAL ANGLERS ARE WELCOME AND AT ONLY £60 PER HEAD INCLUDES ALL THAT YOU WILL NEED FOR A GREAT DAYS FISHING AFLOAT ON A FANTASTIC STABLE CAT CHECK OUR AVALIABILITY PAGE FOR SLOTS CHOOSE A DAY AND RING US ON 07774492856 TO BOOK YOUR SPACE . December 2018 We will not be updating our reports on this site 2019 but scroll through and you will have a good idea of what to expect as the months go by let us know if you want the updates and we will reconsider. We will keep our calender updated though. Great month again with lots of rays mostly med size fish but plenty of them yes of cource we had days when we just could not find them but in the last two weeks of December there seems to have been a new arival of med size fish and last day out for us December 30th 2018 we caught well over thirty fish. 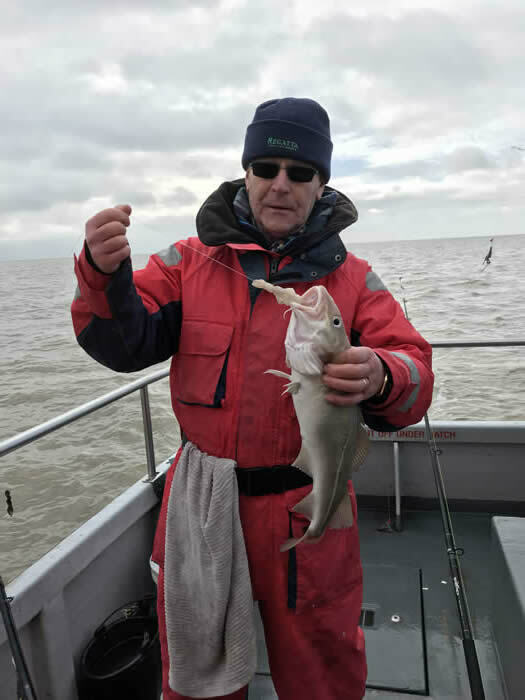 Also plenty of whiting and good size fish too, we are getting the odd codling but to be honest they are few and far between but January last year was our best month for them and just a few days ago a report of a west mersea trawler had a haul of twenty codling in the outer wallet. Another fish that we are getting in numbers is the dab so plenty to catch and no excuse to get yourself out for some fresh air and good sport after pigging out over Christmas. per trip per boat thats around 500 to 600 fish a day never growing big enough to spawn crazy, so now we are reaping the rewards and we still have not learned any thing because even the rarity of catching a codling or two now you hear the clonk on the head and it disapears in the black bin liner you cant blame anglers taking a few home for the pot and quite leagly & who could see this coming, or is it the wind farms because east of them they are catching plenty i wonder there has never been sientific tests to see what effect all these electric cables criss crossing the sea bed have on routes fish take and it certainly would not stand in the way of green energy ?. A great start to october with many specias of fish to catch and what every one has been waiting for the return of the codling.I can report there has been a sprinkling of codling its early days but certainly better than the start of last year. Rays whiting and plenty of bass & still a few hounds making up the daily catches on Sophie Lea and we hope the codling catches will increase over the next few weeks. We have just last week had the police boat fishing nationals and i am pleased to say that my boat Sophie Lea came first again with 637 points second was Gloria b with 596 points third was Eastern Promise with 394 points fourth was Galloper with 367 points and last was Enterprise with 315 points, but more importantly every one had a great day out with sunny skys and calm seas. Autumn fish have started to turn up now with plenty of whiting showing and reports coming in of a few codling being taken, its early days and we will keep you updated both in fishing news free from most good tackle shops and on this site. Rays are once again in good numbers so you can be sure of some bend in your rods, and still a few hounds. Bass are still around and this time of year you can catch some very big fish,dont forget to prepare for your charter some home work before your trip pays dividens a bit of extra bait from your tackle shop a bit of foraging at low tide all helps your trip,there is nothing worst than sitting there watching another angler banging out fish just because you did not prepare or was to mean to spend an extra five quid on a few worms.It has been our privilege to have several partys book us from our friends from the United states airforces based here in the uk thanks for booking us guys and girls hope to see you again soon. Big hound month as you can see anglers bringing the crab baits have done better even mixing rag worm with squid helps to catch the big boys, unfortunatly we are all struggling with hermit crab baits as the very cold weather at the begining of the season has wiped them out so order some pealer crab from your local tackle shop, a bit of home work before your charter pays dividends. A great month with plenty of bass and rays not to many hounds but we have been to marks that dont fish to well for hounds but better for bass and thats what our anglers want. The weather has been great in fact a bit too hot and fishing benifits slightly cooler tempratures. Rays also in abundance so anglers can expect good fishing throught the month. Mackeral also being caught but it takes some time to find them and its not worth waisting good fishing time searching for them. Boom!!! Its all gone crazy in June with hounds bass and lots of fantastic tope of the Essex coast if you fancy tangling with some of these great sporting fish now is the time to book your trip. Very exciting sport especially the tope we have not had such a great run for many years with many anglers hooking up at the same time as the fish predate the baits and with the weather as it is now blue skys and calm seas no excuses tel us now on 07774492856. If you have not had a trip out in a while get your rods out if you like summer fishing as most of the summer specias have now moved in with bass hounds rays dabs lsds etc etc.Still lots of rays if you have not had enough of them and some mackrel reports coming in. Tope have now arived off shore a bit more expencive to target them no mistry that it costs more we just use lots more diesel with a fifty mile round trip, but you have the chance to get the biggest fish avaliable in the thames estuary, our biggest seventy two pounds we have two trips booked results to follow.If you fancy a tope trip give us a ring.Below is a small section of fish we have been catching in the last few weeks. Some great fishing now with anglers booking trips from all over the area, the beast from the east is now just a unplesent memory. Plenty of rays being caught twenty to thirty a trip and more,some very large whiting close to four pounds & in good numbers too. A few small hounds also making an apearence and it will not be long before we start to target this fish as the numbers and sizes increase. A few spur dogs offshore also on the menue but we have to charge a little bit more to target them as they are well offshore and unfortunatly we still cant get fuel free! but these fish do offer a good fight and are very good eating.Still a few cod to be had but its not worth targeting them now as they are few and far between but still catching the odd suprise fish.Bass showing now and also a few small hounds. Just getting over the beast from the east and fishing was very dificult after with all fishing on its knees struggling to catch a few megure whiting and burning lots of fuel trying to get our anglers a few fish. Thankfully the beast is gone and fishing has started to recover with several rays showing mostly small ones some very big whiting and a sprinkling of codling. As the weather warms up a little we will start to see some bigger rays and maybe a few bass. As you can see below a masive improve 24th & 25th March lots of rays some real good doubles up to thirty fish a trip most released with one or two each angler to take home. What a difference a week makes last week with small tides it was difficult to catch any thing but move on five days amazing difference massive tides has bought some very nice codling in along with some nice rays and whiting.Codling up to ten or more per trip at the moment see below more photos to follow. Its going to be a very good spring run of codling as all boats reporting good catches and with the spell of cold weather we are expecting these fish to move in closer and hang around longer so if you have not hooked in to a few codling this year book your self on to one of our individual days you wont regreat it. First time out 10th January in anger due to bad weather at the begining of the month and plesently suprised at the decent fishing with some plump codling rays and whiting all coming to the boat on a lug squid cocktail so dont belive the reports of no codling in the Thames estuary these are prob made buy skippers with nill bookings or anglers that are sitting talking about fishing in the pub.Rods were nodding all day out on the Sophie Lea its early days in January so we will add to this report as the month goes on.Theres now a few rays showing up mixing the catches up a bit so codlings rays and still several whitings with dabs if you want them but pick decent tides if you can as this makes a big difference. Off shore reports of spur dogs in good numbers we are prepared to go off for the partys that want them but its got to be good weather and the right tides so have a chat with the skipper that will be me. Well its definatly been better for codling this year with codling on the boat every trip not lots but from a couple to eight fish and i am talking keepers also lots and i mean lots of whiting in fact so many i wouldnt be suprised if they were not detremental to us catching more codling. Dabs are back again in good numbers but medium to small tides only for this nice flatey.Still the odd ray or two but not in the numbers we had last year which is a good thing as it gives us a change of specias in the spring to look forward to so in summing up well worth a go just pick up the phone individuals or partys welcome. Several codling showing up now a bit better than last year and with this cold snap we are hoping for plenty more,lots of big whiting and still several rays also coming to the boat. Dabs are making an appearence again and the fish every one loves lsds for the uniniciated lesser spotted dog fish. I am writing this blog fairly early as i know some customers are out there waiting for news of codling and hoping to post more photos as they come in. October has started as it should with plenty of whiting, not small fish but some very good size whiting rays and dog fish keeping every ones rods nodding and yes a small showing of codling not many and the biggest so far was a eight pound fish, but lets not forget we are only half way through October as i write this and cod never used to show until mid November.Several dabs showing up also but if your wanting to catch a few its no good casting out a whole squid on a 3.0,4.0, hook as you aint gona catch em scale down to a single hook trace 1.0 hook or smaller and be content to sit there all day fishing like this and you may have a chance at a few dabs or even a dover sole the most common flaty in the thames estuary.Still plenty of bass around and still worth fishing for them but bring worms or dont bother because thats what they are taking. We have just finished one of the biggest boat contests ever held in the thames estuary with boats competing in the police nationals with over a hundred contestance and fifteen charterboats from Brightlingsea West Mersea Bradwel and boats from the Crouch and i am pleased to say that our boat Sophie Lea had the 1st and 2nd winners of the total comp can not help feeling a little pumped up about that see below some of the boats loading contestants in Brightlingsea harbour..We also had a smaller police compatition a week later with Norfolk and Suffolk police with five local boats competing from West Mersea & Brightlingsea and the Sophie Lea did it again with the first and second competitor. Still catching bass as you can see and with the water temp still high i recon we will keep catching them through this month so if you missed Augusts bumper bass month there is still time,i am putting some early September photos up here and there will be more to come. August has been a great month catching plenty of Bass and hounds on Sophie Lea also some nice mackerel the bass fishing though has been the highlight of the month in fact we could put lots more bass photos on here if we had the room so here is a fraction of our catches for this month. Some early pictures in July lots of bass coming to the boat and Kevins fish first left was one of twenty bass caught on the day, also hounds into late doubles and still some very large rays if your not fed up with catching them more to come for this month so keep logging on. A early report for the fishing in June so far, hounds have now turned up giving us some great sport & still catching bass of vering sizes rays still on the menue although we are no longer targeting them as we feel its a lazy charter skippers fish catching these all day. More reports still to come for june as this is being written on the 4th June just to give you a taster of whats happening. We are unlike many boats trying not to take the easy option of fishing for rays as we think most of our clientel have caught as many rays as they need right now. We have been searching different marks targeting bass with some success and other spring summer specias inc hounds spurs and flaties etc however it is still difficult to avoid rays as they are in such large quantitys as such we have not seen the like of for many years. As you can see a few tub gurnards coming on board and what a beutiful fish all returned too. Bass now showing up in increasing numbers and the first showing of a few hounds, still plenty of rays to bend the rods with some realy sood doubles to be had.We will now start moving offshore to target bass best baits for this sort after fish is lug. If you fancy a trip check out our calender pick a date and give us a ring. Not a bad day for our first real day out ten plus rays a very improving picture more photos to come.As promised below middle a fourteen pound ray caught on Sunday 12th March along with many more rays and some very nice whiting these are avarage days at the moment and most anglers are being kept busy all day with plenty of bites and did i mention a codling yes we also had a codling but was released before i had a chance of a photo so this is what you can expect at the moment on Sophie Lea and it wont be long before we will be into the first of the spring bass so check out our avaliability if you want a crack at them but dont leave it to late. Well i know you all want cod but they are few and far between always the chance though and if your not fishing you got no chance.Other than cod it is actualy fishing quite well out today for the first time since christmas with a total of eleven rays lots of whiting and a few dabs and one small bass & every one happy. Its about getting out with a few freinds having a laugh and enjoying whats on offer and you never know whats going to take your bait like all these happy December fishermen below. Sorry for delay in updating site as we have had a crash all ok now, fishing has been fun for anglers with an open mind lots of dabs whiting and a few rays but very few cod, why i dont know could be the water is still to warm after a very hot summer but we are all just guessing it happens some times and its no good wishing for something thats not here but enjoy fishing for what is here. It could be that we catch a load of cod tomorrow but i will tell you somthing you defo wont catch em if you aint out there. Most anglers are ringing in to ask about cod fishing every one is waiting baited breath but at the moment very few cod showing so dont get sucked in buy skippers giving you a load of bull they are not here yet ok the odd one here and there but one swallow dosnt make a summer. I will say that fishing is very good with large numbers of whiting sixty fish a day easy, still lots of rays and the odd bass here and there. We have just enjoyed one of the warmest summer/Autumns and the seas around our coasts are very warm so i recon mid to late November for some cod but dont wait till the last minuet for a booking especialy weekends which we have very few left. Whiting now showing in good numbers and these are mixed in with plenty of medium size rays,several hounds still being caught but these are now leaving the estuarys bound perhaps for warmer waters and talking about warmer waters the sea temp is a very warm 17 degrees the product of a very warm summer which will take a while to cool down and this must have an effect on delaying our Autumn fish only time will tell if this will be the case. Not the best month on our calender but alot of anglers want to get out, many on holiday & the weathers good but the fishing has not been, still catching but its hard getting anglers on the fish. However the snaps below will harten anglers as on board the sophie lea we dont give in without a fight with many of our anglers still leaving the boat very pleased.September will see the start of Autumn fishing with whiting rays offshore schooling bass and maybe some codling inshore. Started good but now towards the end of the month its tough going hounds are mostly mediums to small, bass still around but go with a profecional boat to give you half a chance of catching them we do no were to catch them. Rays still around but no wear near the numbers there was which is a good thing to much of any thing becomes a bore and variety is the spice of life. Bass will soon start shouling up on the offshore banks as you can see below the Sophie Lea is still getting some good bass and yesterday 29th July lots of mackrel. Its Official we have caught more big bass on our boat than any other charter boat in our area so twenty eight years in the business does count and the pictures prove it just today 15th June we added another startling bass to our catch portfolio below with a eleven pound 3oz fish caught buy Barry Gillders released after a photo. Hounds are now showing up at the moment but no big ones but its still early and they will be here generaly July/ August for the big doubles so if you want a trip get booked in now. And how about the two pound garfish bottom right unusualy caught on rag worm bottom fishing but great fun float fishing for them our only bill fish and yes they will even tail walk. Its very early for me to start Mays report but thought our anglers should be up dated on the changing fishing at the moment especialy for the anglers that have had enough of catching rays, bass have featured well in early may for us and several medium hounds i will not ramble on because i will add to Mays news later in the month but check out the pictures so far. Well i promised to add to this report and pleased to say that May has been as good as it started more bass caught than any other May i can remember and hounds and dabs adding to the variety of fish being caught and pleased to say most anglers leaving with some good catches and great memories. ( Get well soon Brian) top left today 27th May Chris Hybes with three bass caught on one rig all released after the photo shoot. Still lots of rays coming aboard but things are changing gradualy and the weather is getting better so we are venturing out a bit further and catching a few hounds dabs and yes you guessed it more rays and dare i mention it a few small bass and of cource released unharmed. If you fancy some bass fishing better get booked in as its always a favorite with our anglers in May/June and we only have so many good tides.Below middle is Kevin with a treble hook up on rays yes three fish on one penal rig a record on board our boat. Its a bit pointless me putting more pictures of rays as i think you all no what they look like and that is what we are catching and in big numbers at the moment along with several large whitings the odd cod but i stress it is the odd one so if its cod your after dont bother you will be disapointed but if you want a great day catching some fantasic rays come on down you wont be disapointed. Holiday time for me as this is generaly our quitest month of the year and what i can gather from other skippers my dicision to be away was the right one with strong winds & poor fishing, but i am back and like magic the fishing has picked up see the last week of Februarys fishing on Sophie Lea below. When the weather alows last week was quite good with rays a few codling and some decent whiting i realy think March is going to be good. As many of our anglers would have heard we have caught on our boat a record beating spurdog of 23 pounds 5oz beating the current british (not Irish) caught spur record buy over two pounds this was caught by one of our regulars Ken Pipe from a mark twelve miles off our port of Brightlingsea it looks like we can not claim the record as we were not prepared to kill the fish and take it ashore for official weighing but i am sure you will all agree a fantasic fish well done to Ken for taking the right decision to release it, the fish was weighed on avery scales and whitnessed buy five indipendent anglers. Biggest cod of eight and a half pounds below caught by Collin Sereey 20th Jan 16 good anglers can winkle em out and they are there but mostly full of herring well done Collin. The Annual national police angling competition was held from Brightlingsea yesterday 5th November and once again Sophie Lea beat all of the boats soundly, we are making a habit of this much to the anoyance of the other skippers. If you have not been out lately you really should as the fishing is excelent today 06 December with only five anglers aboard over nintey fish caught up to six pounds with the codling and rays to ten pounds all the codling are in excelent condition taking lug/squid cocktail. As we get towards the end of this month the big fish will show up which we will then be targeting so make sure you book your space. Some of our lucky anglers were treated to a spectaculer view of a pod of pilot whales around fourty were sighted a very memorable day. And top right Terry Phillips caught this 13pound thornback ray on the 29th November yes even this late in the season we are still catching some very nice rays. Also Mark Nicholes with his ray the following day a 13 pound 13oz fish two specimen fish in late November. It is only early August and the bigger hounds that were so elusive in July have turned up in good numbers with plenty of fish in double figures. Still plenty of rays in certain marks but also lots of very small fish. Bass are still around worm baits a must for this egerly sort fish but dont expect double figure fish they are all around three to four pounds good fun on light tackle and rods.Plenty of big rays in the second half of August now well into double figuers over twenty big fish caught on the 14th August by Roger Chase and freinds bottom right and plenty of bass on the good days with good anglers. Last day of the month and already we are starting to catch codlings four today 31st August along with rays bass dabs dogs and hounds. Mackeral have appeared in big numbers again always a favorite with our customers,plenty of bass on the shallow water marks but dont get to excited as they are not monsters if your lucky they are just keepers but most are being returned. an unusual catch the other day for us was a brill caught on rag worm about two pounds nice to see in fact we are drift fishing on Friday and hoping to tempt a few brill watch this space.Tope fishing has been disasterous with just a hand full of small fish we are on the point of giving up trying for them at least for this year. Still some nice rays to be had and several hounds this is just an early shot of whats happening in early July more photos to come i hope.24thJuly plenty of rays and several bass today so fishing has bucked up as mid month it was a bit dificult out most days check out our avaliability page. Its very early in June but thought i would let you all no whats happening early so you can plan your trips, and for those of you who like a bit of mackrel fishing come on down we must have had over one hundred yesterday in just an hour or less a great bait and even better on the bbq. Still catching plenty of rays and several hounds are now showing up, bass are still being caught in good numbers but you have to spend a bit more money on worm baits. We are taking delivery of a new charter boat a massive fast cat in the next few weeks which i am sure our customers will enjoy and we are offering all our old and new customers a special wednesday discounted trips out on her of ten percent off the normal price and if you have picked up any vouchers from tackle shops lately from other charter boats we will also take these and give the specified discount so its a win win for all, we will be anouncing launch date soon. Below right 4th June nearly one hundred mackeral, bass, twenty plus rays and hounds a great day for all on board. We thought you might like to see the new boat below 600hp FPT turbo diesel engines with cat stability and space check out our avaliability page and come out for a trip with us this is without doubt the best charter boat in the area. Some nice hounds now showing and our best one this week was Roger Chases sixteen pound fish caught today 26th June. May is bass month and as you can see we have been getting our share as its still early we just thought we would post a few photos just to wet your apititie if its bass you want pick up the phone and get yourself on a trip with us. Also caught was our first double figured smooth hound a very nice suprise and it put up quite a scrap.Below is Brian Latcham who was very glad he booked a plase on Sophie Lea 14th May catching a nice 10 pound 9oz bass and total fish caught on the boat amounted to 23 bass and around the same amount of rays and a gurnard. 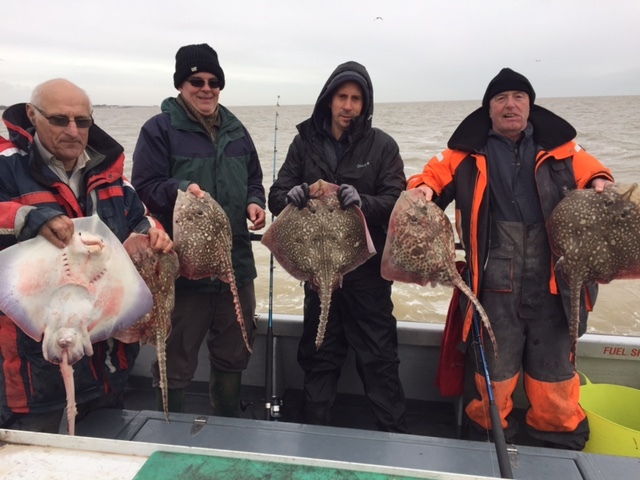 Lots of ray still being caught five anglers today on the boat 6th April with thirty six rays up to twelve pounds, also showing up in the last few days have been a few bass and this will increase as the month moves on. Dog fish and whiting still around in good numbers and a few codling still being caught. The photo below left taken sunday 6th shows Mark and freinds catching close to fourty rays of cource most were released but it shows the amount of rays catchable if your put on the right marks. Second from top centre picture are lads from the military recovering center, we do our bit with help for heros the lads had a great time out with us catching numerous rays and other specias and we hope that the little bit we do helps them on the road to recovery good luck lads you were a pleasure to take out. News flash lots of bass now turned up 23/4/14 over thirty fish & today 24th fifteen fish. Beautiful weather and lots of fish it was worth the wait Kieth Virtigen had a nice Ray of sixteen plus pounds to day 5th March and we lost count of all the other fish photos below. March is turning out to be an excellent month and if you want to catch some cod time is getting short normally we say end of the month so get them rods out. Holiday this month and from what i here was a wast of time wind rain wind rain and i will not subject my anglers to it.. Plenty of nice codling still being caught along with some nice thornback ray also some dabs have made an appearance unfortunately out of ten trips booked since Christmas we have only been able to do less than half but that's January for you so not able to report to much other than put a few photos of fish caught since Christmas. Below left three anglers out with us on the 23rd Jan over forty codling at the end of the day all around three to five pounds great sport.